So began – more or less – a controversy between adherents of the two major schools of thought pertaining to the finishing of high school dressage horses. Though in modern times we perceive – as the above-mentioned quote foreshadows – a conflict between “French, Classical, Academic” and “German, Show, Sport” style dressage, such a conflict would have been no more than an afterthought to Baucher. There was no such thing as “show dressage”, and the notion of a “sport dressage” would have been dismissed as oxymoronic. Since Newcastle, high school dressage had remained clearly in the realm of the fine arts – having emerged as a martial art originally. Indeed, there was what was called “outdoor horsemanship”, which referred to the more pragmatic and less refined notions of racing, hunting, and campaign (mounted cavalry) equitation, but the notion of a high school dressage “competition” would have seemed as strange to Baucher as it would have to La Guerenier and Newcastle before him. 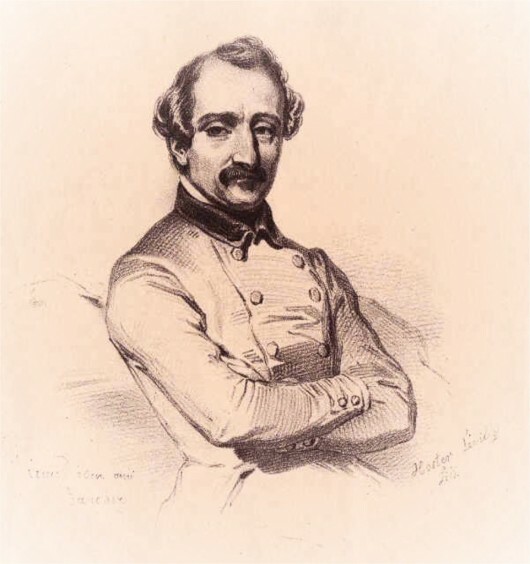 The real and original conflict was between two highly accomplished equestrians, both of them French: the underdog Francois Baucher, and the Comte Antoine D’Aure, his aristocratic adversary. We’ll revisit some of the details of this archetypical struggle later. For now, understand there were only two ways to see high school airs demonstrated in the 1800’s: via exhibitions of riding schools sponsored by the nobility (a la the Spanish Riding School of today, as well as the other three remaining national schools of equestrian art), and exhibitions presented by the “circuses”, then rather high brow affairs, routinely attended by nobility, aristocrats, and intellectuals of the day. Think: a grand ball environment – the likes of which you have probably never experienced, but can imagine – with nationally and internationally known artists as the entertainment; the scent of perfumes in the air, all dreamily lit by grand chandeliers, and the sounds of the best musicians (do not think: clowns, screaming babies, and the scent of old garbage wafting through a dirty plastic tent). Given the thousands of years of horsemanship preceding every master whose opinions and methods have made it into print, we put ourselves at risk the very moment we assert this or that person “invented” anything – whether equipment, a particular technique, or a general method of progression. The very best even our earliest “classical masters” could do – and the very best anyone now living can do – is realize, synthesize, and communicate the genuine truths within their grasp. But even this seemingly simple thing – communicating the truth – is actually quite a difficult thing, because, as C.G. Jung and, before him, Ralph Waldo Emerson, both aptly observed: the closer we come to the very center of a thing – anything – the blurrier things become. This is to say, stumbling across singular truths is difficult enough to do for ourselves – and even more difficult to convey to others. This is true of physics, where every time we think we’ve discovered the fundamental building block of Nature, we find something yet more basic as soon as we try to lock the truth in an objective picture for others to understand. And thus, over the course of science’s wobbly advance, we have leap-frogged from ether, to elements, to atoms; followed by protons, electrons, and neutrons; and, later, quarks, flavors, colors, and so on. So it is with biology, psychology, history, and any other domain of knowledge we put our shoulder against in an attempt to have to the very last word; the main, indivisible thing. Or the very first one, as it were. On approach to the bright light, vocabulary constrains us. Apt words for what we intend to mean do not really exist, leaving us with metaphors and analogies, which can only ever be rough approximations. In the universe of the voice-boxed biped, we are lucky when our listeners discern a shadow of our real meaning. Know what I mean? By many accounts – including his – Baucher could do in months what had previously taken others (and still takes others) years to achieve. He significantly raised the bar for a finished high school training standard in terms of time. He introduced new high school movements (airs) such as lead changes every stride (a tempi) – unknown as a standard prior to his exhibitions, which continue to be regarded as among the most difficult feats of haute ecole. The fact that his methods unabashedly contradicted those of virtually all famous masters since the Renaissance (at least as interpreted by ‘the establishment’ during his day) made Baucher a controversial and polarizing public figure in his time – and he has remained so since among competitors, professionals, and connoisseurs of high school equitation. Though I had ridden extensively from my youth – beginning literally before I could walk – it was not until Baucher that I understood what it was to truly wield a horse. Not just start a horse and ride well at the three natural gaits. But wield … as a kind of bionic auxiliary to my own body – moving myself with his legs as if they were my own. Had his concepts been less intuitive or less repeatable; the results less observable, or the effects less durably exponential, I might have dismissed Baucherism as just “another method” – with new terms for the familiar concepts vaguely grasped by any reasonably experienced horseman. But Baucherism is beyond mere methodology. To borrow Kuhn’s socio-scientific term back from management consultants, Baucher’s system represented a different paradigm – in addition to inverting what had become the traditional order of operations. His greater contribution – much more important than any particular sequence of lessons – was the observation and explanation of key “truths” with immediate utility for every serious student of equitation. Somewhere between Newton’s gravity, and Emerson’s compensation, Baucher observed the natural fact of an innate equine equilibrium which he repeatedly demonstrated could be made manifest under saddle with a range of horse types (not just Spanish horses which had long been optimized for collection), and which he insisted should be quickly accessible to all equestrians willing to understand and pursue tactfully. When I finally experienced Baucher’s notion of equilibrium from the saddle, it was as if – after well over 30 years as an avid and skilled equestrian – I had rediscovered the animal we call “horse” entirely. And that was just the teaser.